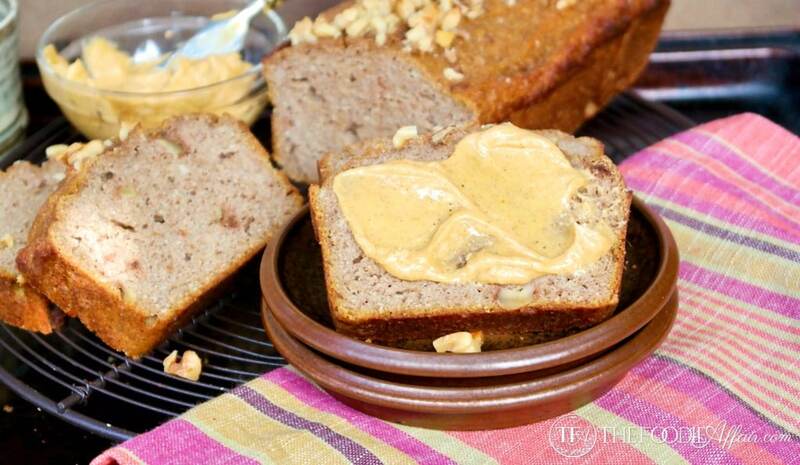 Sugar Free Pumpkin Bread with chopped walnuts! 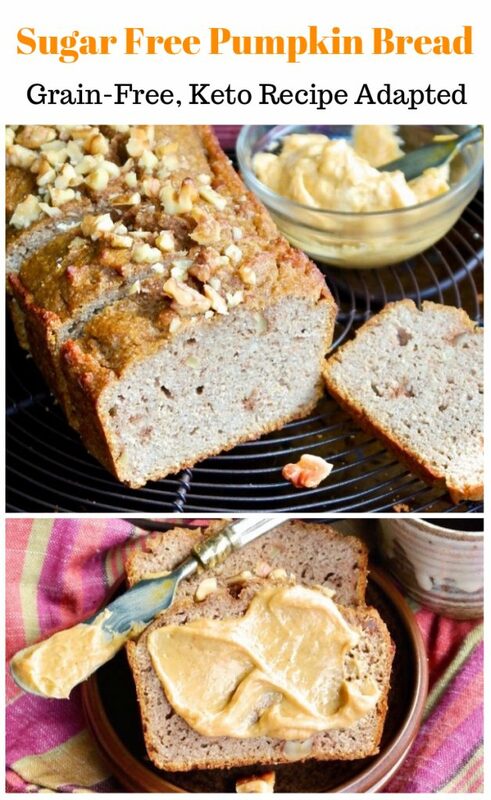 This quick bread has all the flavor of a traditional recipes but this version is made without gluten or refined sugar! Shhhh, no one needs to know that it’s lower in carbs too (5 per slice)! Hey, so it’s officially October and perfectly acceptable to dive into all things pumpkin, right?! I was ahead of the game posting recipes in September, but I couldn’t help myself. This is my absolute favorite time of year! When the weather cools down a bit, I look forward to cozy hearty fall meals like beef stout stew, quick French onion soup, and homemade breads. It’s the calm before the holiday frenzy that I cherish as well. My days are fairly under control, but gosh I can feel when I start to pick up the stress of everyone around me anticipating holiday shopping, and general hustle in our grocery stores, parking lots, and throughout the neighborhood and work. Many years back I consciously made an effort to give myself a break from my own expectations, and have brought back the fun of the holiday season. If I only bake 4 dozen cookies instead of 12, then so be it! If a gift didn’t arrive on time. It’s OK! But it does feel great when I get organized and prep food in advance, so I have started to freeze the pressure cooker pumpkin puree. I hope to have a stash build up to use for months! I have been freezing 1/4 cup portions of fresh pureed pumpkin and have already blended up a pumpkin pie spice smoothie, except I varied the recipe, again! See, the three versions that I usually make are not low carb. I’ll share a low carb beverage soon! Usually healthy and bread don’t jive in the same sentence, so I’m pretty proud to share a holiday favorite with nutritious ingredients! 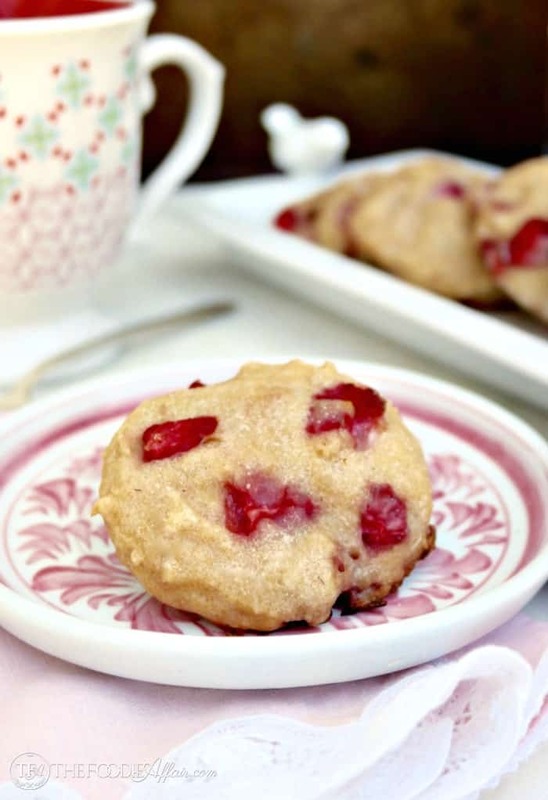 No white flour or sugar included in this recipe, but you sure wouldn’t know! This recipe incorporates superfine almond flour and coconut flour together with the delicious pumpkin spices and a smidgen of maple extract giving this bread a delicious earthy flavor. 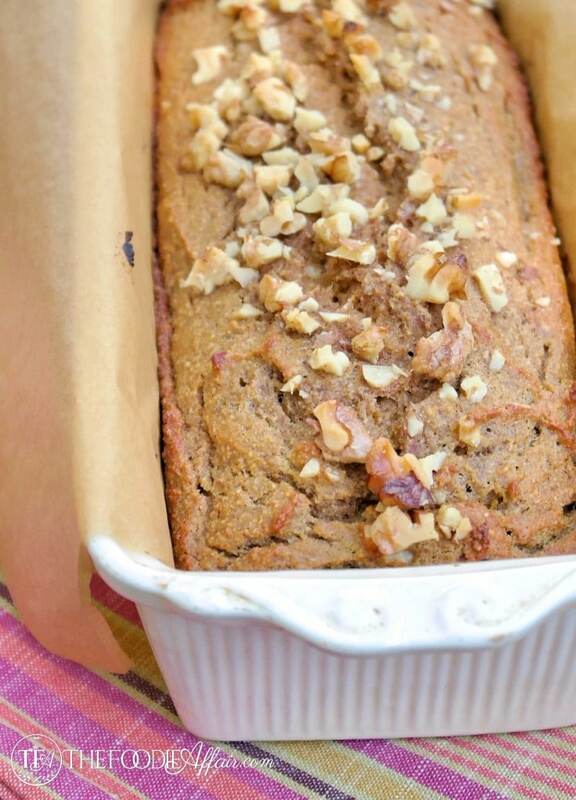 You will love how your house smells while baking a loaf of sugar free pumpkin bread! Yes, gluten free breads smell amazing while baking too! For this recipe I added walnuts. I love the texture it adds to the bread and I only added 1/3 cup, including the sprinkle on top. Add more or less to suit your preference. 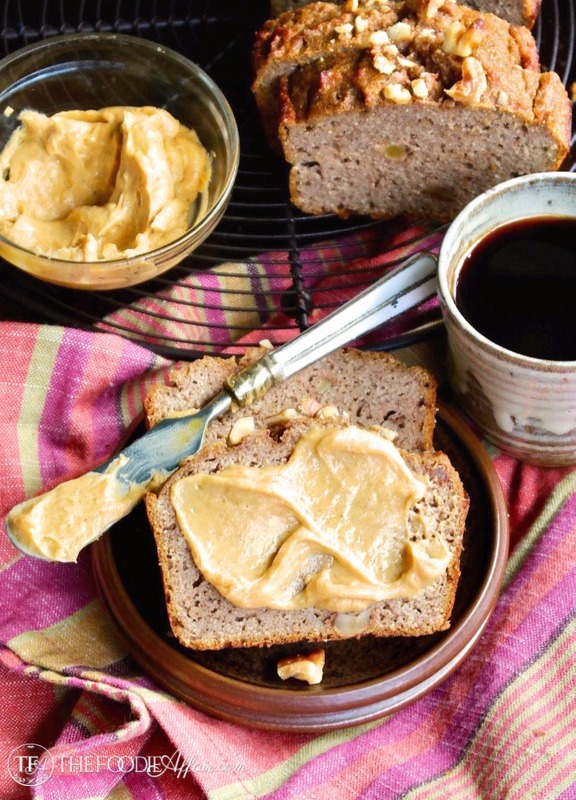 Enjoy a slice of this sugar free pumpkin bread right out of the oven or toast a slice and lather some nut butter or sugar free pumpkin spice butter over it. For additional low carb breads, give these a try! Preheat oven to 400 degrees. Line loaf pan with parchment paper and set aside. 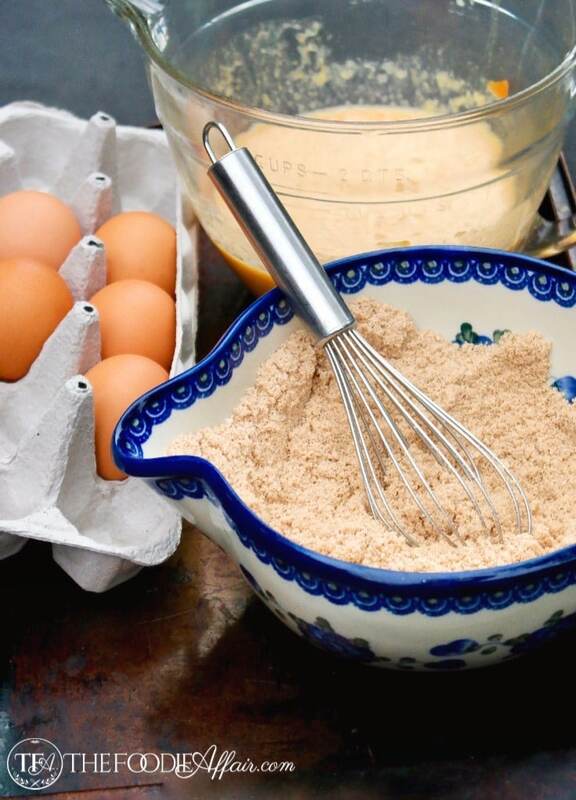 Whisk together almond flour, coconut flour, sugar alternatives, baking powder, pumpkin pie spice, and cinnamon. In a separate bowl mix together pumpkin puree, butter, vanilla extract, and maple extract. Add yolks only. Fold into dry ingredients until well combined. Add walnuts (optional 0reserve 1-2 tablespoons for the top). In a large separate bowl whip egg whites until soft peaks form. Gently fold into batter and place in prepared loaf pan. Sprinkle remaining walnut on top of the batter (optional). Bake for 35-40 minutes or until a toothpick placed in the center of the loaf comes clean. Cool for 10 minutes. Gently remove bread from pan can cool on a baking rack. Slice and enjoy. macronutrients are an estimate based on the brands I used through My Fitness Pal. Your calculations may vary. I bet this would make the kitchen smell amazing!!! My husband and I have been on a homemade bread kick so this sounds perfect! Wow! What an unusual quick bread! I love the taste and texture of almond flour and how cool to use monk fruit. I have to try it! 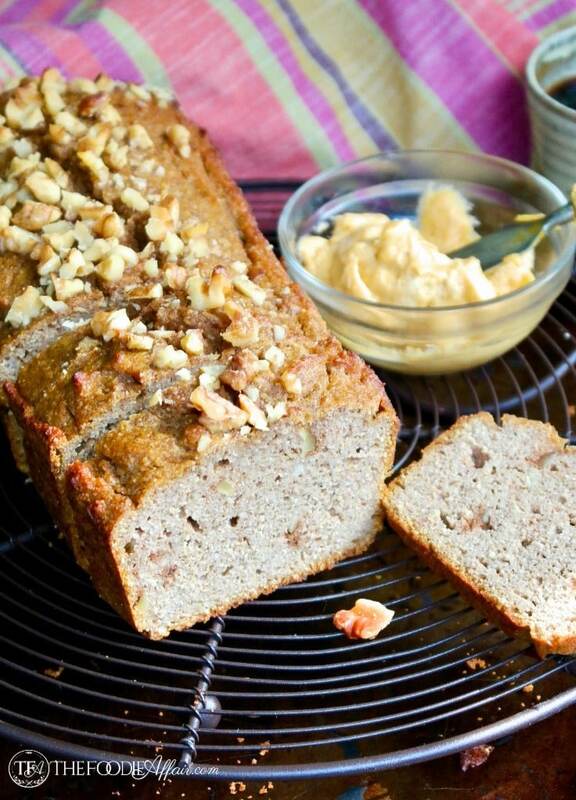 Looks like a really tasty version of pumpkin bread, and without refined sugar is great. Good tip to freeze the pumpkin puree, instead of having a frenzy in the kitchen trying to make as many things as possible with all the pumpkin. Can’t wait to try this recipe Sandra! So are there alternatives to monk fruit if you cannot find that? Pinning! 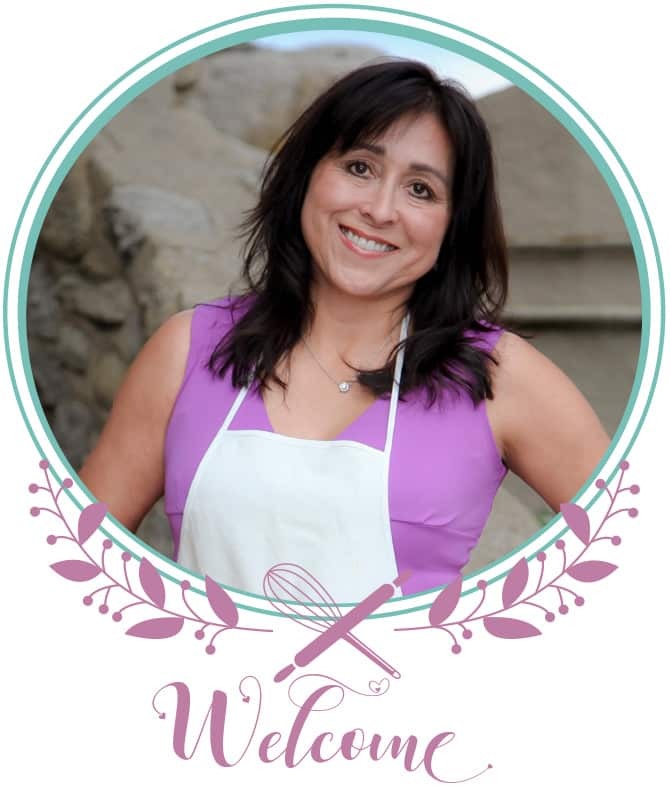 I am always looking for delicious and healthy Fall recipes! This looks like a great one! Sorry to say but lacks the pumpkin taste I hoped for in low carb. Nice moist bread though. Maybe will double the pumpkin and try again. Hi Cheryl, this recipe already has two teaspoons of pumpkin spice, plus extra spices! Perhaps a tablespoon of pumpkin spice will suit your taste buds. I’m glad to hear the texture was perfect!